I don't know where to put this, so if this belongs in another section move it please. I think it's way too soon for that, we barely know anything about the console right now. Edited 1 time(s). Last edit at 06/09/2011 08:09AM by bg4545. That looks pretty cool, and looks like fun wonder if it will be better than the wii console. It's backward compatable with Wii games, maybe they forgot to fix the twiizer attack this time round. Hopefully. They fixed the twiizer attack after it was talked about publicly and newer wiis couldn't use it. I highly doubt it'd work again on the Wii U.
EDIT: I wonder if the backwards compatibility will mean they will have EVERY IOS on the Wii U, as well as the actual Wii U firmware(s). Edited 1 time(s). Last edit at 06/10/2011 10:24AM by SifJar. I know, that's why I finished with "hopefully". How did that twiizer attack fix work again? It apparrently writes garbage data and then verifies if it was actually written, right? Can't they just redirect that somewhere else? Sorry if this is sounds n00by. Didn't the Twiizer attack depend on MIOS? If so, then Nintendo hasn't even said if backward compatibility with GameCube games will be supported. I wold also like to know if every Wii IOS will be persent on the Wii U. However, probably what I'm most interested in knowing is whether or not Smash Stack has been fixed/prevented. They have said GC is not supported. Anyway, what happened was that when MIOS was started (i.e. GC mode was loaded), the memory available was cut down, and only certain parts were accessible, to make it like an actual GC which had less memory. 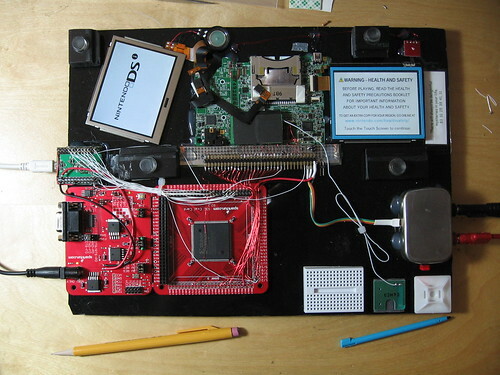 Using a modchip, it was possible to boot GC homebrew fairly early in the Wii's life. A pair of tweezers was used to short circuit some of the "allowed" memory, and access some of the memory that had been blocked off, by bridging from one bit of allowed memory past another bit and into the blocked memory. Then the GC homebrew code running could access that memory and dump it. This allowed TT to map out most the Wii's memory, slowly, including I believe dumping the common key, which in turn allowed disassembly and hence reverse engineering of all Wii executable code (e.g. IOS, leading to discovery of trucha bug). Presumably the fix as you said, writes garbage data to overwrite all the useful stuff in memory. They can't "redirect" that without running custom code, which defeats the point of bypassing the fix. No, but if it writes this garbage data, can you just hook up a different memory chip, make it write to that, read from that, and then just connect it back to the actual chip? A bit impractical, but maybe you could slow the clock speed (???) down so that it gives you a larger "window" of time to do this in? So basically you're saying let it run with the regular chip until it's about to switch (to let all the Wii U stuff get into memory), switch to another chip just before it switches, then switch back to the first chip once it's into Wii mode? I don't think that'd work. Memory is volatile, if it loses power it's gone. So if you switched out the chip, you'd probably just wipe everything that was in memory. Otherwise you could just boot up the console, rip out the memory chip while it's running (probably kill the console, but meh) and dump it. (that's for DSi, but you get the idea). That's a RAM tracing setup, I think it's how TT got the common key for the DSi, not sure. EDIT: Nevermind, that's not how they got the key. It isn't accessible in that way. Edited 1 time(s). Last edit at 06/10/2011 09:25PM by SifJar. But maybe if you somehow got the second chip a power supply, and then just swapped the data connection (?????????). Regarding the Wii U: Since it's backwards compatible with the Wii it's highly likely we'll have Wii mode homebrew from day one of it's release. I can almost guarantee you won't be able to install the homebrew channel, but exploiting savegames and running unsigned code shouldn't be a problem though. Granted, this is practically useless but I guess it's worth mentioning. As bg4545 pointed out, nothing can really be done or theorized until the Wii U's release unfortunately. I'm you're sure your aware (and reading some stuff you wrote later you are), but for the benefit of everyone else: The common key was obtained, multiple savegame exploits were created (including some in DSiWare), and flashcart manufacturers ultimately triumphed with new hardware and several firmware upgrades. Even though a homebrew channel was never created the DSi was still hacked pretty well depending on how you look at it. Yes, Nintendo did significantly step up their security though; Speaking of which, the 3DS is unbelievably secure. Yeah actually, I just realized, as it stands Smash Stack should work on the Wii U as well right? Possibly. They may be able to add something in the compatibility layer that could block it. That's not a hack and we don't care about piracy. Also, I believe the games only work in DS mode with an R4. It will be a great advancement in the hombrew channel comunity to be able to install on the wii u. But we dont know if the Wii u will work whith wii channels.